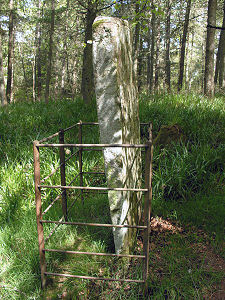 The Hunters Hill Symbol Stone stands next to a track which runs slightly south of east uphill through a wood on the northern flank of Hunters Hill. The track leaves the south side of the A94 a hundred yards east of where a minor road from the village of Glamis joins the north side of the A94. The walk to the stone from the A94 is under a quarter of a mile, and the total distance of the stone from the centre of Glamis is about half a mile. 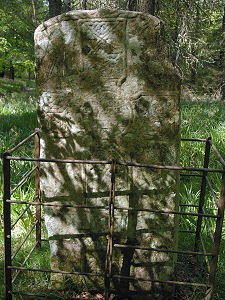 The Hunters Hill Symbol Stone is also known as Glamis 1. It stands surrounded by a protective railed enclosure that has a Victorian feel to it, and probably still stands where it was first erected. It is, of course, entirely possible that the landscape was very different when the stone first stood here, and it may originally have stood in open countryside and been much more widely visible than it is today. Alternatively, its location might imply that the forest track was once a main approach road to Glamis from the east, and the stone had a meaning something like "You are now entering the holy village of Glamis, please pray carefully". 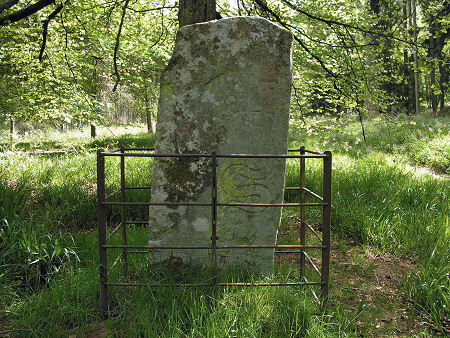 Pictish stones are often categorised into two "classes". Class I are natural stones or pillars with incised carvings, while the later Class II stones are shaped slabs which carry a cross carved in relief on one side and sometimes other symbols as well. The Hunters Hill stone is one of only two that are both: which started out as carved natural stones before later being shaped and having a cross carved in relief on one side. The only other stone that has been reused in this way is the massive Glamis Manse Symbol Stone, just half a mile to the west. The Hunters Hill stone measures 1.5m high by 0.7m broad and 14cm thick. It is less distinct than some, with the carvings partly obscured by weathering and lichen, and made more difficult to trace by the dappling of the light through the canopy of the trees and the railings. 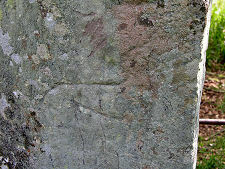 Nonetheless, it remains possible to make out a fairly distinct cross on the eastern face of the stone. 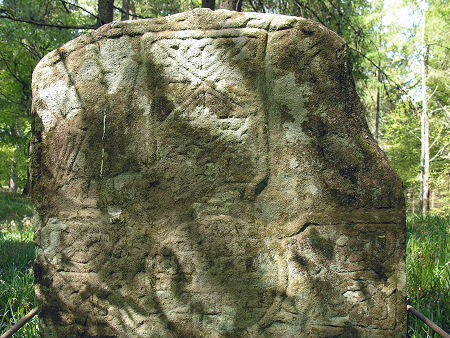 The upper left quadrant of this side of the stone is home to an angel, while other quadrants include a damaged pair of figures; a pair of four legged beasts; and a pair of deer. 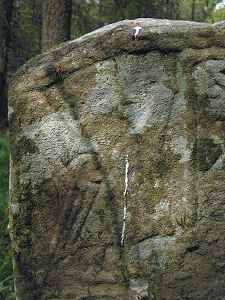 The rear, west, face of the stone is less distinct than the front. 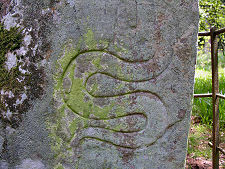 It is still possible to see a fairly faint carving of a beast, above a much clearer snake. The guidebooks will tell you that beneath the snake is a carving of a mirror, but seeing this requires an act of faith.